Nick Van Bakel shoots during Friday's game against Duncan Christian. 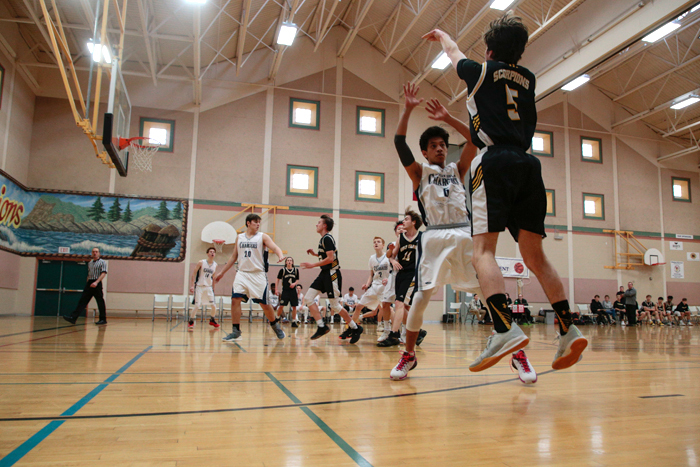 The Gulf Islands Secondary School senior boys basketball team took the top spot at the 14th annual Nairn Howe Memorial tournament held on Friday and Saturday. The Scorpions played through a competitive weekend, with close scores in all of their games. On Friday, GISS first played against Duncan Christian, winning by a score of 66-50. GISS won their second game with another close score of 84-73 over Pacific Christian from Victoria. Saturday began for the local team with a game against Victoria High, where they won by only four points, netting 67 to Vic High’s 63. Their final game wound up going into double-overtime against Parkland Secondary from Sidney, where they were defeated by a score of 88 to 85. Parkland, Pacific Christian and GISS ended the tournament with the same record, but GISS took the top spot based on average scores. Top Scorpions from the four games were Gabe Harrison, Nick Van Bagel, Colton Archer and Ezra Watson. Archer also won the Nairn Howe sportsmanship award for the GISS team.